Our unfinished oak engineered flooring has an extra thick 6mm solid oak wear layer bonded to a 14mm plywood backing which makes our engineered wood flooring up to 70% more stable than the solid wood versions. 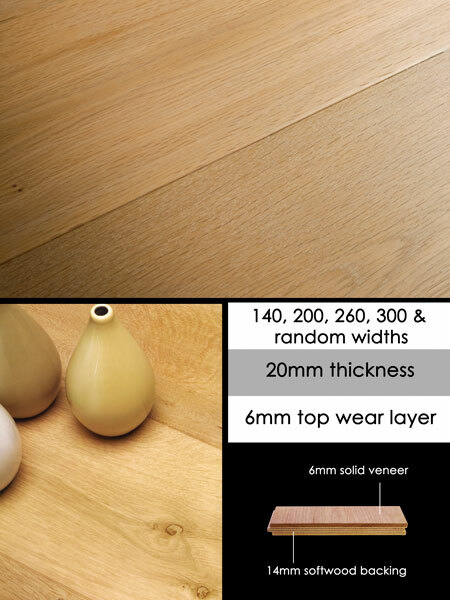 These highly stable engineered timber floors are ideal for fitting over underfloor heating where it is not recommended to use solid hardwoods. Our wood flooring is supplied unfinished but pre sanded allowing bespoke hand finishing on site. Once installed our engineered wooden floors will look exactly like its solid equivalent, but without the inherent movement problems. The wooden floorboards can be bonded directly to concrete and timber subfloors or nailed to spanning timber joists. * 6mm oak top layer. * Eco use of hardwoods. * Unfinished for on site finishing. * Up to 70% more stable than solid. * Ideal over underfloor heating. * Prices exclude shipping @ £80 + VAT. * Samples available on request.